you get an incoming text or other notifications or does the flashing light(or sounds) have to catch your eye an then you knock on screen or press the rear button to see what you got?? Not sure but it should give you options. Thanks. Yeah i have an htc one m7 which was my first android phone but just cant get use to it being that the screen doesnt awake with incoming texts,mail etc. Just a light like most android phones. My contract is almost up so im seeking a new phone. I dont want to go back to apple ios cause of how closed in it is as a ecosystem an hate using itunes to sync. screen wont show only the assigned tone..
Ok 2nd question to those with the G3 already. I havent seen a complete video or demo of the camera software. Are you all able to edit pics with basic built in software like the htc one m7 or galaxy phones to add filters,crop,rotate an more?? beezlebubz and khodr.chehab like this. Sweet! Yeah if i get it i'll just be using the stock messaging app. But thats good news to my ears to know the screen wakes up when i receive a message. Now does that only happen with stock messaging text app and not with face,email etc. or it will still wake up as well? Are there different colors of LED notification for different things? For example, on my S3 it is blue for texts but green for Facebook, etc. I don't think you can change the colour of the LED notification as a stock option. I can't answer if the screen wakes for other functions as it's not something I've really noticed. Light flow works great with the G3 so that you can have custom colors for your different notifications. If you are worried about missing calls or messages the G Flex is amazing. Giant rear notification light has saved my bacon several times. Yes. There are like 7 different led colors lol. Does the G3 have a screenshot toggle? Does it charge slow like the htc one m7 which takes forever? Is it worth upgrading to from the m7? Yes to all three. Power + VolDn should be the screenshot key. I know you don't like this answer but Android phones (and I don't expect the G3 to be any different) don't turn on the screen when you receive a text, etc. 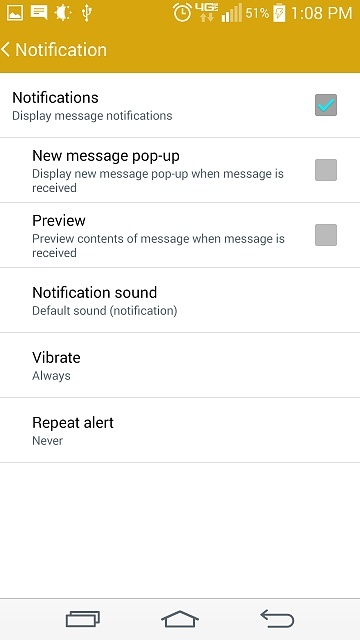 That is what the notification light is for - to let you know that something has come in and in fact you can program different colors for different kinds of notifications (SMS, Voice Mail, E-Mail, etc). If your screen turned on for every notification your battery would be gone in a couple of hours. My S3's screen turns on and shows previews of text messages. 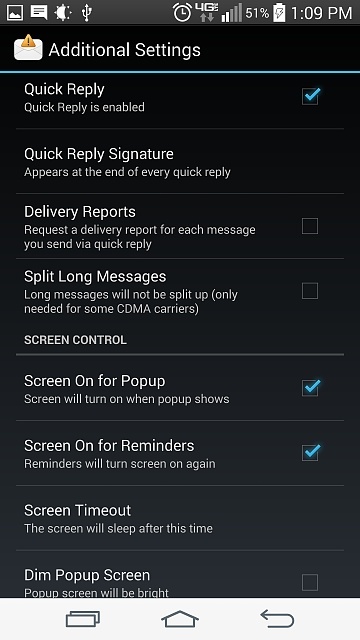 Yeah, screen turns on on the stock messaging app, it helps the battery to use hangouts! My Note 3 did the same thing. My G3's screen does not turn on when I get a text message. I do miss that from my S3 but understand the hit on battery life it could take to turn on the screen over and over. The notification light on the G3 is so much smaller and slower that I think I may miss it if I have my sound off. as follows to get the behavior I wanted. for through the combination of settings. 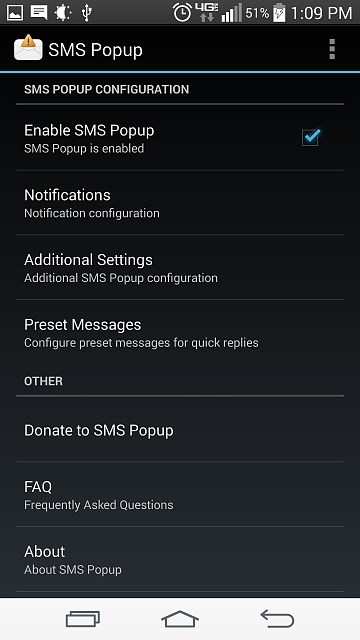 off the default message app popups. So does the original Note 10.1 take a 64 gig microsd? Is the Galaxy Note 2 still worth it? tablet rebooted 3 times in less than 2 hours! what is the cause for that?